I booked annual leave for the whole week beginning Monday 11th November. My Lady had A Significant Birthday on Thursday 14th, so we arranged a trip away to the NSW South Coast, where we planned a week of celebrations. Sounds great, doesn’t it. Life, as is so often the case, had other ideas. First, my Lady’s mother sadly passed away on the 9th. This led to family chaos and my Lady needed to go to Sydney to try to sort that out. A flurry of phone calls and we postponed our holiday for a couple of weeks. While we were at it, we postponed the birthday as well. So my Lady packed up her car and took off to Sydney leaving me at home considering SOTA projects. I needed to put a plug on the Bencher paddle so that I could use it with the FT817. Then I needed to make up a power lead for the FT817 complete with in-line fuses. And if I still had time I wanted to construct another link dipole, this one for all bands from 7MHz up to and including 28MHz, and when that was done I wanted to experiment with loading coils so that it could also be used on 3.5MHz. Well, once again life had other plans. On Monday afternoon I noticed I had a cough. Nothing much, only a little tickle, just annoying really. I had a cup of tea, fixed the keyer plug and the power lead, and thought no more about it. Then I woke up on Tuesday morning sick as a dog. By Friday I was still crook but the family chaos had been sorted and my Lady was back home. The weather was looking a bit better too, and as I’d been stuck in the house all week we thought a little SOTA expedition might help my recovery. So the maps came out and we checked for an easy one with no bush bashing and preferably one I hadn’t activated before. Mount Granya came to mind because it has a good 2WD road all the way to the top, meaning only a short stroll into the activation zone. What was more, I had attempted to activate it earlier in the year but been foiled by the SLABs lack of oomph leading to the Barrett 940 refusing to transmit any RF. Probably my fault for not having charged them continuously for two weeks before going up there, but then the Barrett is a bit pernickety about its supply voltage. Anyway, now I have the FT817 so that problem wasn’t going to stop me again. Eventually a CFA truck lumbered out of the smoke and Lollipop Man took this as a sign that the road was now clear. He turned his sign to GO and waved us through. Some minutes later we emerged, coughing a little, on the far side of the smoke cloud. Once again we were on our way. We made it up to the Summit without further drama and proceeded to have lunch. We were a bit later than I’d said I would be in my Alert on SOTAWatch but we were hungry after the trip and I figured that at least some of the chasers would still be there when we’d finished. When we arrived, another couple had bagged the picnic table and were enjoying their lunch at the Summit. Fortunately we’d anticipated this and had our own chairs and whatnot, so we settled ourselves comfortably and munched happily, keeping one hand free to wave at the flies who wanted their share. On the Summit there is a fire tower and beneath this there are a couple of huts which evidently contain a fair bit of electronic gear. The huts are air conditioned and from time to time a fan would start up, with a noise that wasn’t loud but sounded quite intrusive in the silence of the bush. We noted this and decided to move well away from the fire tower compound to set up for the activation. 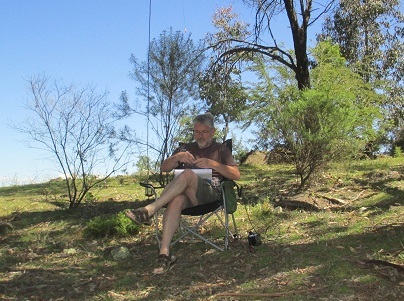 I eventually chose a spot some 100m away, where we couldn’t hear that pesky fan and where there was a tree strategically located from which I could hang the dipole. I lobbed a line over a branch, hauled up the antenna and was on the air a moment later. Conditions on 7MHz were mixed. I was getting some strong signals from VK2 and VK3 stations but most of them were affected by deep fading, with some going from S9+ to S3 or lower. I listened for a while to see who was about and then in short order worked VK3AMB, VK3BNC/p, VK1MA, VK3CAT, VK3ANL, VK2ARZ, VK3KG/p, VK3OHM, VK3AFW, VK2DAG, VK3BHR, VK2IO, VK3ZPF/p, VK2FAJG and VK3FPSR/m all on 7MHz SSB. When there were no more takers I popped out the dipole links and went up to 14MHz but there wasn’t much happening up there, just a few Russians working a contest on CW. If I’d hung around for a while it might have opened up a bit but by then my lurgy was beginning to reassert itself and it was time to go, so we packed up, carried the gear back to the car and headed down. and so that’s what I told everyone I worked, until Ron VK3AFW came up and told me that’s not correct and it should be VE-165. Ron was at home looking at SOTAData, so I knew he must be right. Bugger! I’ll chuck that copy of the ARM and download a new Summit list from SOTAData for use from here on out.